This is a brief excerpt from my presentation at NTPRS 2018. 1) If I did not have to assess notebooks, I would not. 2) I have to assess something so that my class "looks like school". Because it doesn't really. So this is what I do. 3) There is some value in holding students accountable for their learning. But I don't think there is value in a language class for holding students accountable for what they have not yet acquired. Thus, I do not mark errors. 4) Notebooks are graded as "work", or in my case, "Language Participation." 5) If I assign summative assessments (e.g. reading quizzes), I have students turn in the quiz to me so I can grade it quickly (and not have a stack of notebooks). When I return the quizzes, they glue them in. · Each page is between 2-10 points, depending on what it is. · Accept late/missing content up until the Hard Deadline. · At the beginning of each marking period, plan out when you are going to collect, grade, and return notebooks. 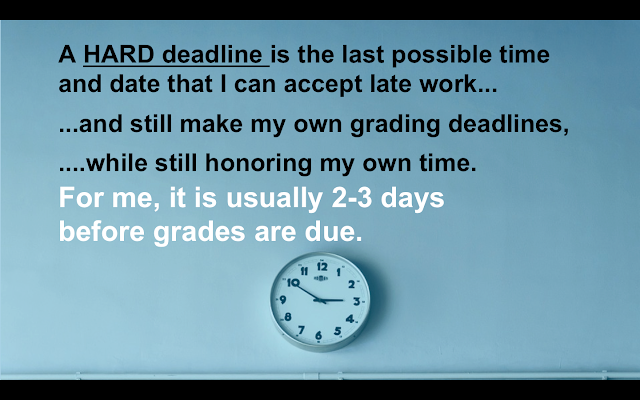 Also make note of your own deadlines (grades due, etc.) and decide when your hard deadlines will be. 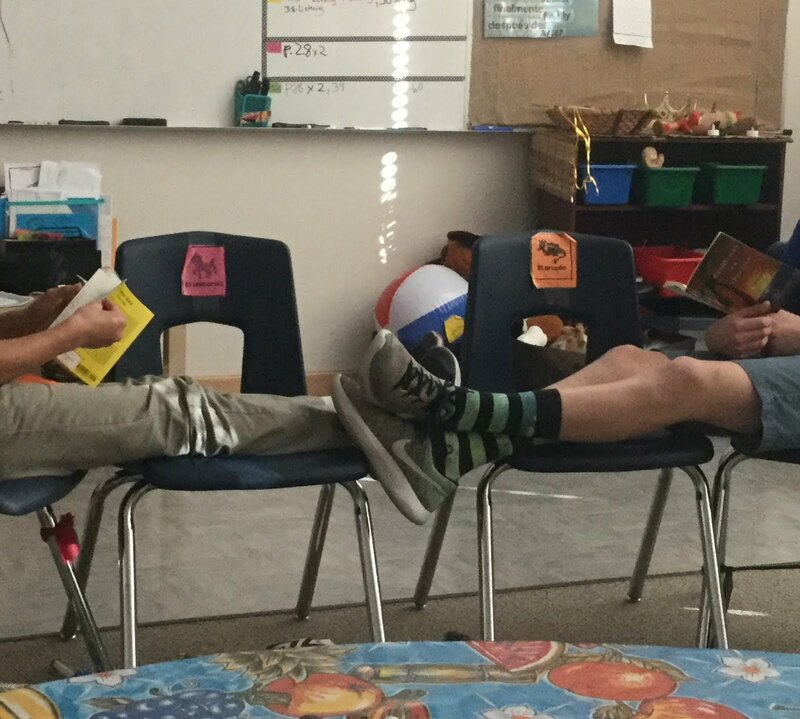 · Use a reliable student to keep track of handouts for absent students and keep them in an "absent student" folder. · Don't worry about keeping a "master" notebook for each class. 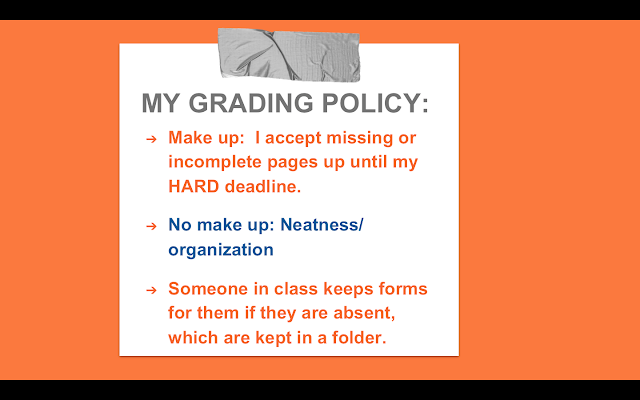 Instead, when you grade, chose a student who is never absent and fairly organized, and use theirs as a model. Thank you! This is helpful. I especially appreciate the gentle and yet firm way you present the concept of the "hard deadline. am about to take the plunge tomorrow with these notebooks even though it is in the middle of the year. I am SO sick of my kids asking "Can we throw this away now?" This may seem insane, but, are you ever worried about a student giving their Spanish 1 notebook from this year to a Spanish 1 student next year that has all the answers to assignments, quizzes, etc.? This has been one thing that is keeping me from diving in! Hi, that is a good point. 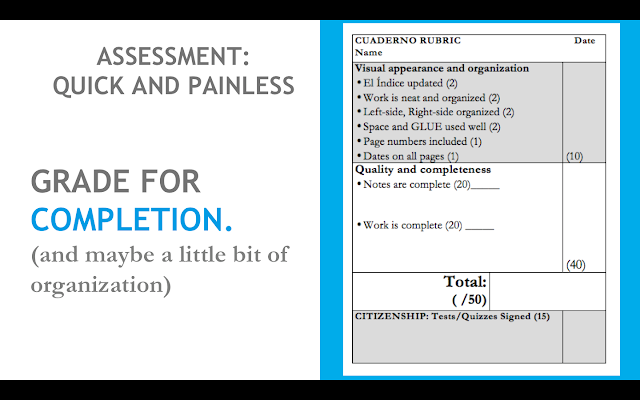 One thing that I do (and you can check out the assessment tags to the right to see more) is that I don’t mark wrong answers on assessments, but grade them on a rubric. And honestly, although I have taught siblings and I guess there is that possibility, I frame a lot of discussions about assessments with the idea of integrity, and use standards based grades that take the focus somewhat away from A, B, etc. and move the conversation to proficiency. Some of my former students report that having their notebook in high school is a huge help to them, so the ones that save it, love it!